My job requires that I travel a lot and, since October, have been travelling long-haul flights every month, primarily to Europe with a couple to Singapore via Hong Kong. With an increase in travel and layovers, I recently re-evaluated my travel gear and made some adjustments so that I was maximizing my packing for carry-on travel but also maximizing comfort of pushing luggage and bags through airports – especially when running to make connections. Summer packing tends to be easier, just because the volume of clothes is less. 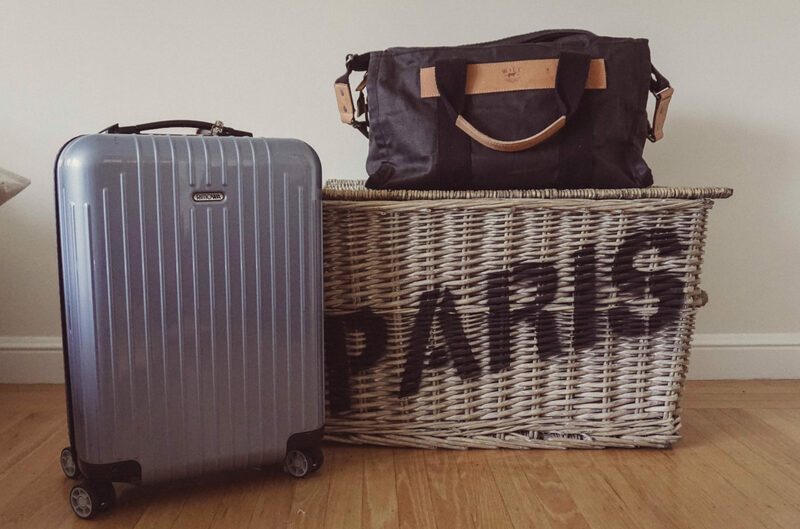 Winter travel on long-haul flights with just carry on’s can be tricky simply because of the bulk that winter clothing has (boots, jackets) and also because long-haul flights have stricter carry-on sizes. After years of trial and error, I feel like I’ve got winter travel down right. I’m very happy with my luggage upgrades and packing necessities. Here are my some of my tips on packing for winter travel. The best investment I made last year was my Rimowa Salsa Air carry on. You will not believe how weightless this is – huge when spending lots of time in airports or filling it to the brim. It maneuvers so effortlessly as well – I literally had to run through a huge crowd in the Hong Kong Airport to catch a flight and if i had any other suitcase, I honestly don’t think I could have moved as well. I love that each side has it’s own zipped pockets – I no longer use packs whilst travelling and can fit everything neatly into each side. It’s so, so, so worth the money – trust me, I’ve used it heavily on 8 international trips in the past 6 months! The second best investment was my Will Canvas Bag. I use this as my “purse” while travelling (which my actual purse inside that holds my wallet, passport etc.). It serves two purposes: it holds things that I need to take out quickly and easily for screening (computer, liquids) and things I need easy access to whilst in-flight (headphones, books, wrap, snacks.) The adjustable (and thick) strap makes it very comfortable if you’re carrying it on your shoulder or cross-body. The flat bottom and study sides help it sit easy atop my Rimowa (although I do use a bag bungee just for added ease when walking through airports). One thing that’s always in it is this universal travel charger and adapter. After having tried several, this is by far my favorite as it works easily in any country, I can run both my computer and iPhone off of it at once (and I don’t need a separate charger for my iPhone since it has USB) and it’s very lightweight/compact. Packing for winter travel with one suitcase is a huge challenge because sweaters and boots take up so much room. That’s why my carry on is a large bag so I can fit as much winter layers as possible. My tricks? I try to resort to one pair of boots that go with everything – all my clothes, day to night, casual to fancy. And then I wear them on the plane. Yes it’s a pain to get in and out of during screening but the room in your suitcase will thank you for it. I also wear my heaviest sweater and jacket on the plane and then just store these for the flight. It also helps with space in the bags. If I’m doing a lot of walking in the winter, I opt for layers. Walking in a heavy winter coat can make you sweaty or overheat believe it or not. So if it’s a milder winter day, I’ll wear a blouse or lighter layer under my heavy wool coat. This will keep me warm without overheating. If it’s one of the colder days, I’ll wear a light layer, a sweater on top and then my heavy wool jacket. So if I get warmer, I can remove the sweater or if in a museum or restaurant I can just remove the jacket and be OK. The right socks/tights become really important to keep your feet warm in winter. If you’re walking on a lot of cobblestones or in rain, you want to make sure your feet aren’t freezing or your whole day can be ruined. So light shoes are a no-go. If you have a favourite pair that aren’t winter ready, consider getting a thicker insole or wearing heavier wool socks or tights. And I always make sure to bring a hat (my favourites are from Christys’ London) so if it’s raining or snowing I can keep my head dry in a way that umbrella’s sometimes fail. Hats are especially great in misty weather or very light rain – you can navigate crowds better and you don’t have to worry about wear to store your wet umbrella. See my Pinterest Board on Packing For Winter Travel to see what made the list and be able to click-through if the widget below isn’t working. Love the post! I now live in London so can confirm Europe’s winter can be rather chilly… and long-lasting! I also have a Rimowa Salsa Air and could not recommend it more. Super lightweight and I love how it rolls upright on all four wheels. It is expensive but I received 10% off online Charles Ford which helped 🙂 Agreed, worth every penny! Sarah – hope things get warmer for you soon 🙂 And yes, the Rimowa is totally worth every penny! I would love to read your list of clothes, but there is something wrong with the list, unfortunately.